The northern district, Island-in-the-Sky, is located 32 miles southwest of Moab, UT. This district is the easiest to access and offers expansive views deep into the canyon. Take the short half mile walk out to Mesa Arch. Along the way, you’ll be exposed to “living dirt” - biological soil crust that stabilizes the earth. 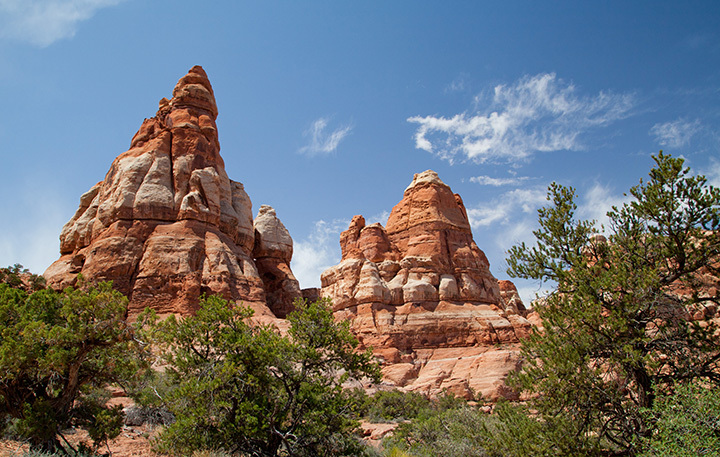 The Needles District is found in the southeastern section of the park and features a host of colorfully jumbled landforms. Hiking opportunities abound in this District and include: Roadside Ruin, Pothole Point, Cave Spring and Slickrock Foot Trail. For a much more adventurous trek, don’t miss our favorite hike - the 11-mile Chesler Park Loop beginning at Elephant Hill. On the road to the Needles District, you will pass by Newspaper Rock - one of the world’s largest and best preserved collections of petroglyphs. Stop by the Rock and spend a few moments catching up on the ancient news. The Maze District remains as one of the most remote locations within the continental US. There are no paved roads into the Maze and those who venture to explore this section of the park must be fully prepared for a very primitive experience! The River District is comprised of the Green and Colorado Rivers, both of which have carved through the sandstone helping to form two deep canyons. Above the Confluence, where the rivers join together, the waters are calm. Below, the combined waters of the Green and Colorado begin a 14-mile stretch of white water called Cataract Canyon - as treacherous a stretch as any found on earth! When to visit: Canyonlands is open year-round. The best time of to visit this rugged park is in the spring and fall when the daytime temps are below 80° and the nighttime temps won’t freeze you! Summers will be teaming with people and quite warm. 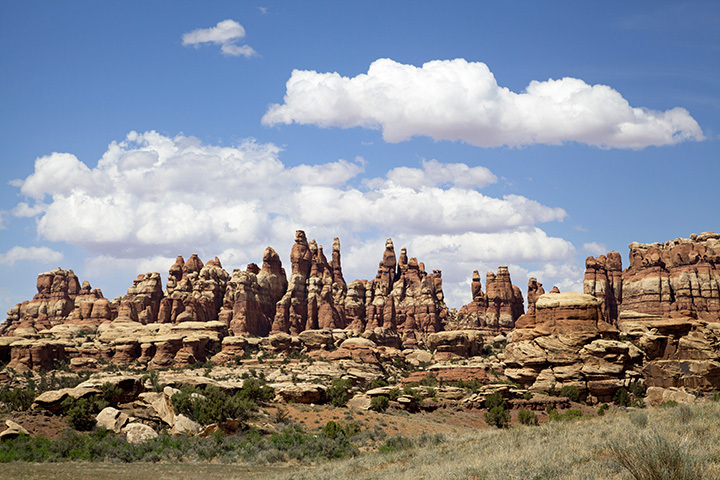 What to do: If you’ve only got a single day to visit Canyonlands – visit the Island in the Sky District. Drive out to Grand View Point Overlook and take in the expansive views of Canyonlands. 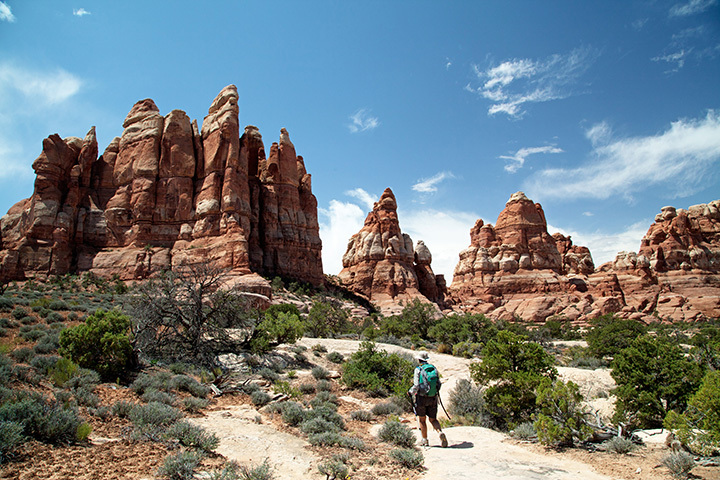 If you have more time, camp out in the Needles District where there is plenty of hiking, biking, backpacking and stargazing. Any of the several short hikes in this District will delight. Where to stay: The city of Moab, UT is a short distance from the Island in the Sky District and offers several lodging options. There are two campgrounds inside Canyonlands: The Willow Flat Campground, located in the Island District has 12 campsites, but no water. The Squaw Flat Campground in the Needles District has 26 sites, flush toilets and water year-round!